He was just 13 year old when he quit school to help out in his father’s saree business. This young lad had dreams – dreaming of something larger than life from a very yound age. This is the story of Vashu Bhagnani who celebrated 25 movies under his home production Pooja Films. Vashu Bhagnani moved to Mumbai in 1989. The city of dreams beckoned him. He landed in the field of constructions and ventured in it. It was in the year 1993 that Aankhen was released. This young man was so passionate about films and he liked this one very much so much so that the evening show of this David Dhawan’s superhit action-comedy changed his life for ever. He decided to become a larger part of the magical world of Bollywood. He got in touch with David Dhawan and thus began his journey in Bollywood with their first film – Coolie No:1 released in 1995. Over the years he produced successful films like Hero No.1, Bade Miyan Chote Miyan, Om Jai Jagdish, Rehna Hai Tere Dil Mein, Deewanapan, Shaadi No.1, Do Knot Disturb and other not so successful flicks like Tera Jadoo Chaly Gaya, Jeena Sirf Mere Liye, Out of Control, Vadaa, Silsiilay, Antar Mahal and others. He launched his son Jackyy Bhagnani in 2009 with Kal Kissne Delha, and then took him again in F.A.L.T.U. and in Rangrezz. Jackyy’s upcoming film next week – Youngistan is his latest production. Vashu has seen ups and downs in the Hindi film industry, with unsuccessful films like Silsilay, Antar Mahal, Sorry Bhai and the latest being Himmatwala (2013) which was panned by the critics as well as the masses. And Vashu Bhagnani makes it a point to deliver that entertainment. 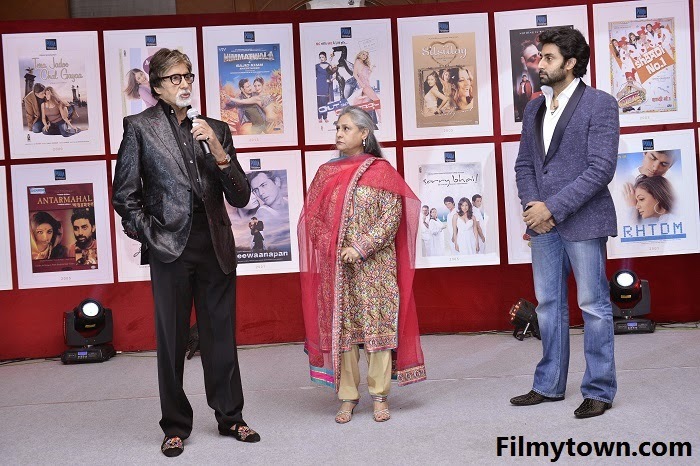 The event was attended by top Bollywood stars like Amitabh and Jaya Bachchan, Abhishekh Bachchan, Hritik Roshan, Diya Mirza, Ritesh and Genelia Deshmukh, Randhir Kapoor, Anu Malik, Sajid Khan, Sushmita Sen and Arshad Warsi.